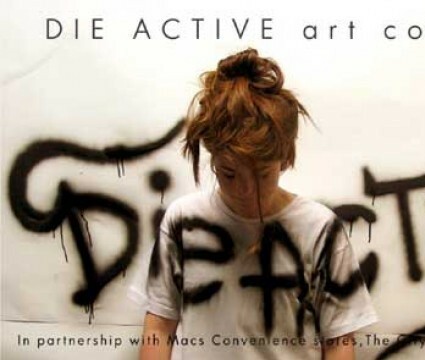 Definitely Superior Art Gallery’s youth art collective “DIE ACTIVE,” will be taking on a large public painting project in partnership with Mac’s Convenience stores and the City of Thunder Bay’s Crime Prevention Council. This initiative is a pilot project developed in celebration of youth, community and arts in Thunder Bay. A collective of youngblooded Die Active artists, including local professional graffiti artists, will be “Paintbombing the Mac’s” at 346 May Street North in Thunder Bay. A large-scale professional contemporary wall art painting will be designed and executed by Die Active youth, following mentorship workshops and training at Definitely Superior Art Gallery. It all culminates Saturday, May 5th at 5pm with A BIG REVEAL and a BAcKAlleY Party to which everyone in the community is invited. Featuring break dancing and DJ performances by Classic Roots, with Die Active youth artists in attendance, pizza by Eat Local: Pizza&Pastry, car stereos, film crews, media and supporters! This innovative art partnership project builds upon the growing strength/phenomena of the Die Active youth art collective, now entering into its 4th year of contemporary art activities involving new generation artists. Part of National Youth Arts Week.